Oil and Cotton: Camp Design Build Adventure: REGISTER NOW! Camp Design Build Adventure: REGISTER NOW! Our friends at El Cosmico are hosting an amazing Design Build Adventure Camp December 15-22, 2011. No previous building experience is necessary and the class is designed to inspire and inform everyone from architects looking to get their hands dirty to laypeople who'd like to experience the design build process for the first time. This is a wonderful opportunity to explore and learn about magical Marfa. DON'T WAIT, the Deadline to register is November 30th! Visit the El Cosmico website for more details. Learn. Create Community. Get Your Hands Dirty. Play. This 6-day workshop focuses on locality and community in design build - not just the materials and the construction techniques, but how climate, geography, socioeconomics, personal relationships and even factors like the food, music and art of a place can and should influence design. More than just a how-to clinic, Camp Design Build Adventure is about creating meaningful experience as we work. We believe that an important part of the design process takes place in shared communal moments around the camp, dinner table, and bonfire. Throughout the course of the workshop, Adventurers will source materials locally, design and construct furniture, and build their furniture designs all within the context of creating moments of community, purpose and fun. This winter's workshop will focus on furniture design for a good cause. 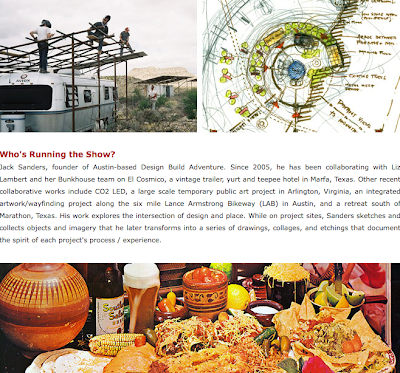 The course begins with an introduction to the art and architecture of the area - participants will gain unique access though private studio visits with artists and designers living and working in Marfa, and campers will have site-specific design sessions in some of the area's most interesting settings. Adventurers will then build their furniture designs in the El Cosmico shop using exciting tools and fabrication techniques. In keeping with the spirit of Camp Design Build Adventure, the week will culminate in a community event for locals and campers - we'll enjoy food donated and prepared by Farmhouse Delivery, and completed furniture pieces will be auctioned to benefit the West Texas Food Bank. See the daily schedule here.